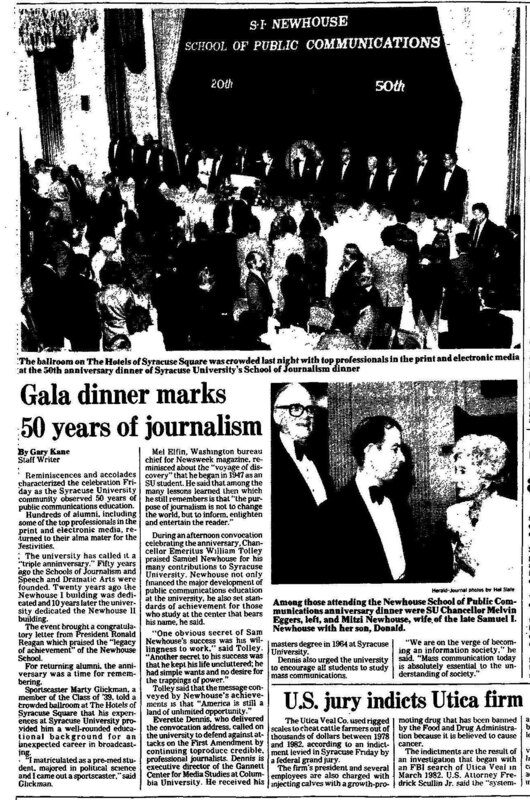 At a gala dinner on the night of Sept. 21, 1984, the Newhouse School celebrated “50 years of journalism” at Syracuse University. The event observed the anniversary of the founding of the School of Journalism in 1934. The event was attended by the widow and sons of S.I. Newhouse Sr., who had died in 1979. Alumni Marty Glickman ’39, a prominent sportscaster, and Mel Elfin ’51, Washington bureau chief for Newsweek, also attended and spoke at the event.